Ancestry.com does a great job of finding common ancestors between DNA matches when both parties have trees. The layout is easy to navigate, intuitive, and well integrated, but sometimes the WRONG person or couple is shown as providing the shared DNA. This problem can occur when you share multiple common ancestors with a match but you or your match have have not yet found all of them. In September 2016, I received a new match at AncestryDNA – B41. Based on a comparison of B41’s tree and my tree, Ancestry provided a “Shared Ancestor Hint” indicating that Barnabas Pratt was our common ancestor and that we were 5th cousins three times removed (5C3R) as shown below. Note that Ancestry’s “Shared Ancestor Hint” in the above image indicates that B41 and I match through my paternal side. Ancestry does not show any other “Shared Ancestor Hints.” There would be gray circles on either side of Barnabas’ name with arrows in Figure 1 if there were other hints. Because B41 is a “distant cousin” (predicted as a 5th to 8th cousin), Ancestry doesn’t provide “Shared Matches” as shown by Figure 2. Who knows if we do or don’t have Shared matches. I was very excited to have B41 as a match via Barnabas Pratt because it would help me verify that particular branch which is connected to my Mayflower line. I hoped to get B41 over to GEDmatch and use him to separate some of my Mayflower matches from other lines, like the Pratt line, that were married into my Mayflower (Sprague to Warren) line. After a short discussion with B41, he uploaded to GEDMatch and that is when things got interesting! I ran the One-to-One tool at GEDmatch. This is the key tool to compare DNA between two people. 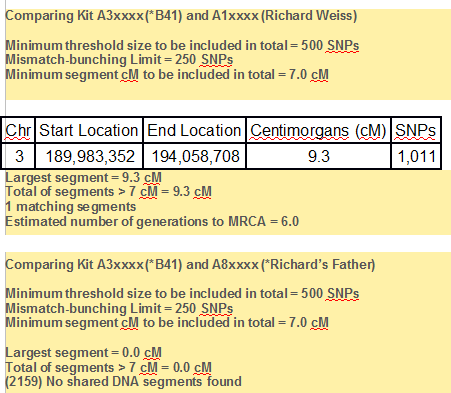 B41 and I matched but when I ran One-to-One between B41 and my father’s kit at GEDmatch, they did not match as expected. Houston, we have a problem! Barnabas Pratt is on my paternal tree! I started comparing B41 to my immediate maternal family at GEDmatch, to see if I matched on that side. B41 did not match my maternal half siblings; but he did match our maternal aunt, see Figure 4. Not only did B41 match my maternal aunt, he matched her on the same place on chromosome 3 that I matched B41. This is the important part – that we all match and that we match at the same place – that in other words we share an “overlapping segment.” Plus I match my maternal aunt on that segment also, therefore it is a three way match. This is known as triangulation. Our match with B41 is valid as proven by the overlapping segment on chromosome 3. The ancestor that provided B41, me, and my immediate family the overlapping segment on chromosome 3 is somewhere down my maternal branches, not my paternal branches as Ancestry predicted. 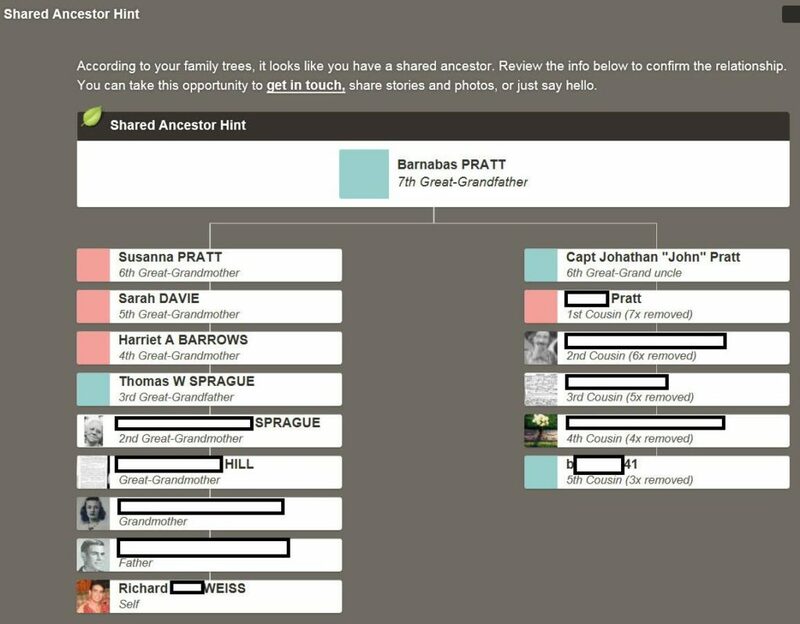 Ancestry’s “Shared Ancestor Hint” that Barnabas Pratt is the common ancestor between B41 and me is incorrect, but only from a genetic perspective. While both B41 and I did not get our shared DNA from Barnabas Pratt or his wife, we are still descendants of him and his wife. B41, my aunt, and I got the same bit of DNA from someone other than Barnabas Pratt or his wife – and we have no idea from whom other than it is an ancestor on my maternal side. A check of my mother’s and aunt’s AncestryDNA match lists for B41, now that I know to look, shows that B41 is not listed in either my mother’s or my aunt’s match list at AncestryDNA. GEDmatch to the rescue again. GEDMatch can help where Ancestry’s choice not to provide Shared Matches beyond 4th cousins fails us. Next, I ran the “People who match both kits” tool at GEDmatch. I ran it against both B41 & me and B41 & my aunt. B41 and I now have a list of folks to work with to help narrow down where to look in our trees or at least isolate our shared segment to specific branches in our respective trees. The search continues but now as a community! What you have just seen is the problem with AncestryDNA’s approach of 1) not giving us a chromosome browser and 2) not listing “Shared Matches” beyond 4th cousins. Without both of those tools, we can’t confirm that a match is associated with the predicted common ancestor (a chromosome browser required to do that) and we don’t have other in-common-with matches to work with to figure out who the actual common ancestor is (need to see shared matches beyond 4th cousin to do that). Not having either tool at Ancestry is challenging. Not having both tools not only is disabling but perpetuates false perspectives and “bad science.” It also makes it hard for us to meet the Genealogical Proof Standards. It’s like having to rely on Family Lore all over again. GEDmatch enables us do the validation and research but the problem is that not all AncestryDNA testers have transferred to GEDmatch – so we are limited. Work with your matches to validate every one of Ancestry’s “Shared Ancestor Hints” at GEDMatch. As a result, Ancestry’s “Shared Ancestor Hints” cannot be used to accurately confirm an ancestor, much less be used as a Genealogical Proof Standards (GPS) which should be the goal of all genealogists and family historians. NOTE: This is just one of several examples. I have not explored all 234 of my “Shared Ancestor Hints” to this level of detail. Thank you Richard for this interesting guest blog post. Richard Weiss is member of the DNAadoption team. He assists with all DNAadoption classes as well as supports development of and updates to the DNA prediction chart, “How To’s”, class materials, and refining DNA search methods – in addition to being a search angel. I may have missed this in the post but I noticed that when I view matches with a distant cousin on ancestry and click on shared matches I will see the closer match. So if I look view match for john Smith and click on shared matches I see my 1c1r Louise Campbell. I take a note on John Smith, because if I view my match with Louise Campbell and click on n shares matches I will not see John Smith. I add him there manually with a note. The “Shared Matches” function is only supposed to work for your matches that Ancestry has put in the Parent/Child, Twin/Self, Close Family, 2nd Cousin, 3rd Cousin or 4th Cousin categories (the categories found in the orange boxes). It does not (or isn’t supposed to) work with your matches that Ancestry has placed in the “Distant Match” category. The example I’m using is for a cousin in the “Distant Match” category. What are you defining as a “Distant Match”? Like you, I also use the “Shared Matches” function with my 4th cousins and closer to help assess a proposed “Shared Ancestor Hint”…but without more tools, the Shared Ancestor Hint can still be wrong and we will never know. You are correct that you cannot see distant cousins (5th-8th) who are “shared” with closer matches. But you CAN see closer matches who are shared with distant cousins. If you had any 4th cousin or closer shared matches with B41, they would appear on B41’s “shared matches” list. So, in your example here, Ancestry is obviously not picking up B41 as a match to your maternal aunt. But click through some of your other distant cousin matches and you should find some instances where there are shared matches in the 4th cousin or closer range. I think what we need is a way to report back to Ancestry what the real deal is. I’m sure I have a number of instances where the Shared Ancestor is not the actual source of the shared DNA. I also have two instances where the ancestor matching was wrong – as in these are not the same people. Instance #1 – Distant match and I each descend from a woman named Elizabeth JORDAN. In looking at the parents and spouses of both women, it is apparent they are two different people. Ancestry thinks they are one and the same and therefore a Shared Ancestor to us both. Instance #2 – My husband descends from Spilsby COLEMAN b 1692 VA. For some inexplicable reason, Ancestry has decided that a William COLE b 1692 VA is just a variation of Spilsby COLEMAN and that is who the Shared Ancestor is. Completely and totally agree with the premise of this post. Just this week I posed this very issue in a group forum. My wife had a new Shared Ancestor Hint show up, because I added some additional generations to her MATERNAL tree. The shared ancestor shown by Ancestry was indeed someone we know to have been on the maternal side. Problem is – there is not match whatsoever between this person and my wife’s actual mother, which means the match has to be PATERNAL. While I appreciate Ancestry’s attempt at tying us all together, and using trees to “help” us, we definitely need to remember that matching based on trees is only as good as the trees themselves. Getting the data to a third-party chromosome is vital, and the fact that Ancestry has not yet provided any kind of segment information is inexcusable. I read this whole thing as just another (veiled) complaint about not having a chromosome browser at ancestry. These are HINTS. Not facts. The bot makes mistakes. Many trees are questionable. Take it as a research tool and, as with any other record, research it as best you can. There is a work around for comparing match lists past 4th cousin. You can run the dnahelper app by snavely on chrome. It will compare 2 tests for all matches when it is working properly. But it also easily downloads a match list file. Then use a spreadsheet program or database program to compare. As long as you have access to run on both tests you can do that. You can also use the dndgedcom client to create match lists. Gabriele, the “HINTS” are the stuff that DNA Circles are made of. Fidelity to the true source of the DNA is crucial. I have a good example of how Green Leafs can be wrong. On one of my Moderate matches, D.G., I have two green leafs. One Green Leaf points to a paternal ancestor. The other Green Leaf points to a maternal ancestor. But I only have a match of 7.2 cM over one segment. It would be extremely difficult to explain how one small segment could match to both sides of my ancestry. One Green Leaf is probably right and the other very dubious. The paternal match Green Leaf is much closer than the maternal match Green Leaf, so probably the paternal Green Leaf is right and the maternal Green Leaf is wrong. I believe the trees to be accurate and I have lots of other matches to both families. Not everyone is as proficient as you. Just send her the URL of the public version of your tree and leave it at that. You are correct that bluntness is often perceived as rudeness so try to be nice about it. 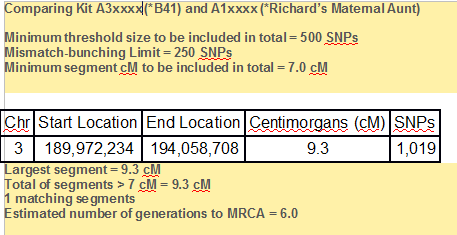 When I get a genetically impossible hint (materal ancestor but maych is not among my mom’s matches using AncestryDNA Helper chrome plugin) I use it as an opportunity to invite a match to upload their dna to gedmatch, first explaining why the hint is wrong, but if they’ll give me a gedmatch kit number, I’ll tell them whst I’ve learned about those actual matcing DNA segments so far. I do the same when I have a match with more than one hint but on different lines. I just completed Ancestry.com and received my results. Much of those results seem too speculative to be useful. No evidence of “family lore” DNA, which I am not so willing to discard. In fact, the results seemed a bit odd, and weren’t very helpful. I also immediately started receiving messages from people who were hoping to make connections to their own family trees. I didn’t experience excitement, just disappointment, since some of these also seem like a real stretch (6th cousin, etc.). While at first, I was caught up in the excitement of a DNA test that could help me determine my background, I now see the limitations and the potential for error/omission. Am not sorry I did it, as it’s a learning curve, but I remain unconvinced of the “accuracy” and am too lazy to do the tedious work of tracking down relatives with more information. Well some of us enjoy the fun of it. The problem for some and perhaps you as well, is if your ancestors are recent immigrants you will have fewer matches.